It's perhaps a measure of how grounded Daredevil has been as a show that the opening of this episode - with our hero fighting an honest-to-goodness ninja - comes across as a little startling. 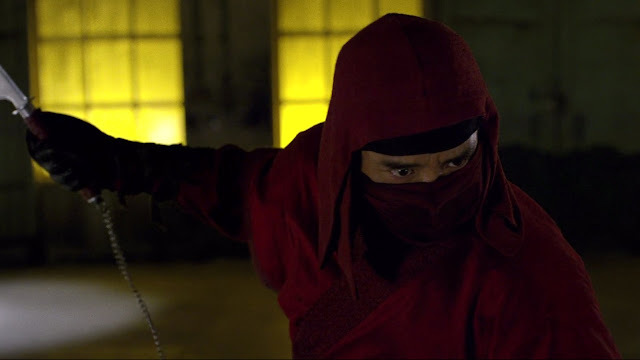 Not just any ninja, either, but the previously-met Nobu, who is asked by Fisk to deal with the masked man who is proving an obstinate obstacle to Fisk's plans. Nobu, a man of honour, decides to deal with it personally, explaining the opening sequence in which he fights Daredevil with a wicked blade. He's also clearly a leading member of the Hand, long a presence from the comics. We end the fight unresolved early in the episode and jump back to the build-up to it, and a very important question. Our first sight of Matt Murdoch out of costume in this episode is at church, where he discusses with the priest questions of morality. The priest tells a tale from a mission of a man who fell foul of local warlords. The man was so good that he won over those sent to kill him, and the leading warlord asked to meet him in person, this man who so impressed his men. Then the warlord killed him in front of everyone. The devil exists, says the priest, and he takes many forms. Murdoch asks what if he could have stopped him. The priest asks how. Later, we see in a discussion between Murdoch, Foggy and Karen the thought is troubling our hero. "We're not going to stop him with a deposition," he snarls. A return to the priest sees him confronted with the question directly. "The question you have to ask yourself is are you struggling with the fact that you don't want to kill this man but have to, or that you don't have to kill him but want to." So long, Mrs Cardenas, we hardly knew ye. The client who has been the face of the team's legal case is found dead, and the clues lead to Fisk's door. Fisk, however, boldly uses her death to say this is exactly why he is doing what he is doing, that he mourns Mrs Cardenas but that the city deserves better. A bitter Karen reflects that she hopes that the man in the mask will rip Fisk's head off. Matt returns home, deliberates for a long time, crosses himself and dons his Daredevil outfit. Out to the streets he goes, to shake down information that might lead to Fisk's guilt. In doing so, it's hard to tell he's a hero, the way he beats on people. Also in doing so, he comes to face Nobu. The fight is brutal, leaving Daredevil cut and bruised - but at the last, he is able to defeat Nobu, who goes up in flames and dies. Did Daredevil mean to kill him? That's unclear, and we don't have time to dwell on that, because the Kingpin arrives, thanking him for removing Nobu and tacitly admitting his role in Mrs Cardenas' death. "I'm going to kill you," Daredevil declares. "Take your shot," says Fisk. After all the choreography of the fight against Nobu, Fisk instead is savage, a wall of a man whose fists swiftly bludgeon Daredevil and leave him broken on the floor. "Disappointing," is Fisk's verdict as he walks away, leaving Wesley to finish things off, but Daredevil is able to make a break for it and escape. A few more this time - Foggy mentions Captain America, the guys who attacked Karen are Joseph Pike and Stewart Schmidt - bit part players from the comics who were lowlifes at Josie's Bar, and was it just me that was amused when Matt meets Vanessa when he goes to buy art/size up his opposition, he refers to his apartment as a bit stark? Yeah, yeah, I know. Also, in genuine easter egg territory, when beating up various hoodlums, Daredevil finds some drugs marked with a symbol - that symbol is of the Steel Serpent, a resident of K'un L'un and linked to Iron Fist (who of course has his own Netflix series down the line). Lastly, in the comics, when members of the Hand die, they go up in smoke. Well, the same happened to Nobu, I guess, even if his flames were for a less mystical reason.